BASES of VA, LLC was formed by 2 long time Certified Vocational Evaluators who are not coincidentally, long time users of Valpar Component Work Samples. When Valpar Intl. decided to halt production of their work sample product line in late 2006, we are surely only 2 of many who were sorry to see the loss of a true classic, established standard, assessment “yardstick” for the field of Vocational Evaluation. While many of us tried to reconcile the loss with what it could mean for our profession and figure out how to “get by” with the option of purchasing only order forms, replacement parts, and consumables – Nancy Scott had other plans. 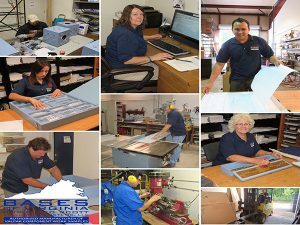 Busic and Scott Evaluation Systems of Virginia (BASES of VA) came into being in late 2008 after it was determined that Valpar Intl was interested in providing for the continuation of their work samples by selling rights to manufacture the time tested product line. Nancy Scott: Nancy is an undergraduate of Seton Hill College with a BS in Psychology and a Master’s level, MS recipient from the Mecca of vocational evaluation, UW-Stout. With 33 years of experience as a Certified Vocational Evaluator, Nancy retired from the school system to operate Bases full time. Nancy has work experience as an evaluator in the public schools and in a private-not-for-profit rehabilitation center, Harmarville Rehabilitation Hospital. With respect to professional organizations such as VECAP and affiliation with CCWAVES, the certifying body for vocational evaluation professionals, Nancy has a lengthy history of support and service. She has been a member of VEWAA (the Vocational Evaluation and Work Adjustment Association, a division of the National Rehabilitation Association) and then VECAP (the subsequent professional organization for Vocational Evaluation and Career Assessment Professionals) since 1982. Nancy has held numerous volunteer and elected positions for each organization. She also served as the VECAP representative or Commissioner to CCWAVES for 3 years prior to its dissolution. She was the 2005 recipient of the prestigious Paul R. Hoffman award and The Bill Hinek Lifetime Transition Forum Award in 2010. Nancy is married with 3 daughters – husband Will is an engineer at NASA. Danise Busic: Danise is an undergraduate of Wake Forest University with a BA in Psychology, and a subsequent Master’s degree in Rehabilitation Psychology from Appalachian State University. Like Nancy, she has been a CVE for 25+ years, working for the state of NC Division of Vocational Rehabilitation Services, Spotsylvania County Public Schools in Virginia, The National Rehabilitation Hospital in Washington DC, and Fairfax County Public Schools in Virginia. After moving to the DC area in the late 80’s, Danise completed an Ed.S. degree in Special Education at The George Washington University. She later began teaching there as an adjunct faculty member in both their Collaborative Vocational Evaluation Training program and the Rehab Counseling program. Like Nancy, Danise is a long time member of VEWAA/VECAP and has held local, state and national offices over the years as well as serving on the CCWAVES board as a representative for VECAP. She was Chair of the CCWAVES commission for the final 2 years of her 5 year term. Together: They were truly dedicated to furthering the profession of vocational evaluation by enhancing the opportunity others have to access this well researched work sample system. Valpar Component Work Samples are part of our educational and professional background. In 2014 Danise decided to sell her share of the business to Nancy who is now the sole owner. Staff: Bases currently supports a staff of 3 full time employees and 3 part time employees. Will Scott: Husband of Nancy works part time and consults as an engineer to problem solve, program and maintain equipment such as the CNC machine and 3-D printer which has taken manufacturing into the new millennium. He is also working on ideas to develop new work samples and update existing work samples using new technology.